Shocking images emerged from the purported attack, showing pale, lifeless bodies of children lined up on floors of makeshift hospitals and others with oxygen masks on their faces as they were attended to by paramedics. BEIRUT — Syrian anti-government activists accused the regime of carrying out a toxic gas attack that killed at least 100 people, including many children as they slept, during intense artillery and rocket barrages Wednesday on the eastern suburbs of Damascus that are part of a fierce government offensive in the area. The attack coincided with the visit by a 20-member U.N. chemical weapons team to Syria to investigate three sites where attacks allegedly occurred during the past year. Their presence raises questions about why the regime — which called the claims of the attack Wednesday “absolutely baseless” — would use chemical agents at this time. Shocking images emerged from the purported attack, showing pale, lifeless bodies of children lined up on floors of makeshift hospitals and others with oxygen masks on their faces as they were attended to by paramedics. One appeared to be a toddler clad in diapers. There was no visible blood or wounds on their skin. The reported death toll Wednesday would make it the deadliest alleged chemical attack in Syria’s civil war. There were conflicting reports, however, as to what exactly transpired and the death toll ranged from a hundred to 1,300. Syria’s Information Minister called the activists’ claim a “disillusioned and fabricated one whose objective is to deviate and mislead” the U.N. mission. “If the Syrian government has nothing to hide and is truly committed to an impartial and credible investigation of chemical weapons use in Syria, it will facilitate the U.N. team’s immediate and unfettered access to this site,” Earnest said. Syria’s ally Russia, however, described the reports as “alarmist.” Foreign Ministry spokesman Alexander Lukashevich issued a statement in which he said the “aggressive information campaign” laying full blame on the Syrian government side suggests this is a planned provocation aimed at undermining efforts to convene peace talks between the two sides. The heavy shelling starting around 3 a.m. local time pounded the capital’s eastern suburbs of Zamalka, Arbeen and Ein Tarma, according to the Britain-based Syrian Observatory for Human Rights monitoring group. The bombardment, as well as the sound of fighter jets, could be heard by residents of the Syrian capital throughout the night and early Wednesday. Gray smoke hung over towns in the eastern suburbs. Observatory director Rami Abdul-Rahman cited activists in the area who said “poisonous gas” was fired in rockets as well as from the air in the attack. He said that he has documented at least 100 deaths, but said it was not clear whether the victims died from shelling or toxic gas. However, he and other opposition groups described a ferocious offensive on the eastern suburbs known as eastern Ghouta, saying “hundreds” of shells and rockets were unleashed by regime forces Wednesday on the region. Another group, the Local Coordination Committees, said hundreds of people were killed or injured in the shelling. The Syrian National Coalition, Syria’s main opposition group in exile, put the number at 1,300. The group said it was basing its claim on accounts and photographs by activists on the ground. Such different figures from activists groups are common in the immediate aftermaths of attacks in Syria, where the government restricts foreign and domestic reporting. George Sabra, a senior member of the Coalition, blamed the regime, as well as “the weakness of the U.N. and American hesitation” for the deaths. “The silence of our friends is killing us,” he said, adding that Wednesday’s attack effectively killed off any chance for peace negotiations with the regime. Syria is said to have one of the world’s largest stockpiles of chemical weapons, including mustard gas and the nerve agent sarin. The government refuses to confirm or deny it possesses such weapons. 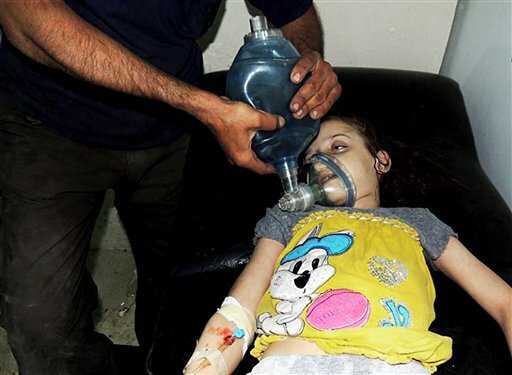 In June, the U.S. said it had conclusive evidence that Assad’s regime used chemical weapons against opposition forces. That crossed what President Barack Obama called a “red line,” prompting a U.S. decision to begin arming rebel groups, although that has not happened yet. An opposition activist and a pharmacist in the town of Arbeen who identified himself by the pseudonym Abu Ahmad said he attended to dozens of injured people in a field hospital after the shelling on Zamalka and Ein Tarma early Wednesday. He said many were moved to Arbeen. He said bodies of 63 of the dead had indications of a chemical weapons attack but he could not confirm this. Abu Ahmad, who declined to give his real name fearing for his own safety, said he based his belief that the symptoms could indicate a chemical weapon attack because he had attended to two victims two months ago brought in from Jobar, a neighborhood in Damascus, who had the same symptoms and were believed to have been injured in a chemical attack. Activists in Zamalka told Abu Ahmed that an additional 200 people died in that town on Wednesday. Arbeen is five kilometers (three miles) to the northeast of Damascus. The Syrian government denied the claims of a chemical weapons attack Wednesday. “All what has been said is ridiculous and naive, unscientific, illogical and subjective,” said Information Minister Omran al-Zoubi, speaking to Syrian state television. He said the organized media campaign was a result of the regime’s successful operations against rebels on the ground. The head of the U.N. team in Syria to investigate previous claims of alleged chemical attacks said he wants to look into the latest claims. “It looks like something we need to look into,” Sellstrom, who is Swedish, was quoted as saying. He said a formal request from a member state would have to go through U.N. channels and Syria would need to agree — and there is no guarantee that it would. France said they will ask the U.N. to visit the site of Wednesday’s alleged attack. President Francois Hollande, speaking at a regular Cabinet meeting, said the latest allegations “require verification and confirmation,” according to government spokeswoman Najat Vallaud-Belkacem. Hollande would ask the U.N. to go to the site “to shed full light” on the allegations. The EU, Germany and Turkey also called for immediate U.N. access to the site of the alleged attack. The Syrian government long has denied claims by the opposition on chemical weapons use, while saying rebels fighting to overthrow President Bashar Assad’s government have used such weapons. Following Wednesday’s reports, the Observatory called upon the U.N. team in Syria and all international organizations “to visit the stricken areas and to guarantee that medical and relief supplies reach the people as soon as possible.” It also called for an investigation into the attack. Mohammed Saeed, an activist in the area, told the AP via Skype that hundreds of dead and injured people were rushed to six makeshift hospitals in the eastern suburbs of Damascus. An activist group in Arbeen posted on its Facebook page pictures purporting to show rows of Syrian children, wrapped in white death shrouds, and others with their chests bared. There appeared to be very little signs of blood or physical wounds on the bodies. An amateur video showed four children on the floor of a makeshift hospital, apparently unconscious, as a doctor is seen giving them some sort of shots. A bit later, a child starts shaking slowly. Other videos show bodies of children lined on the floor of a room, showing no signs of life, and rows of dead men who appeared to be fighters. Very few of them showed signs of blood or physical wounds on their skin. The photos and videos distributed by activists to support their claims were consistent with AP reporting of shelling in the area, though it was not known if the victims died from a poisonous gas attack. Sellstrom’s team of U.N. experts is meant to probe three sites: the village of Khan al-Assal, just west of the embattled northern city of Aleppo and two other locations, which are being kept secret for security reasons. At least 30 people were killed in the March 19 incident in Khan al-Assal. Assad’s regime and the rebels have blamed each other for that attack. Unrest in Syria began in March 2011 and later exploded into a civil war. More than 100,000 people have been killed in the conflict.